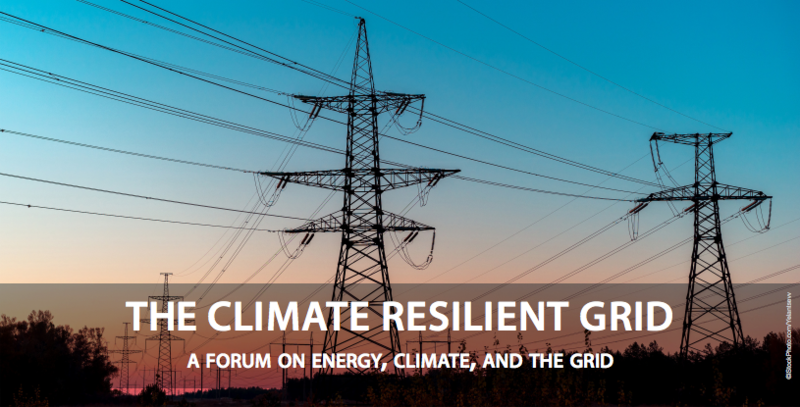 THE CLIMATE RESILIENT GRID: A FORUM ON ENERGY, CLIMATE AND THE GRID, sponsored by NOAA’s National Centers for Environmental Information (NCEI), brings together thought leaders from industry, government, and academia to demonstrate the value of environmental intelligence and climate data for bringing renewables into homes and businesses around the country. Together we explore how climate science and data can inform energy challenges related to integrating renewables into the grid. Raising the level of renewables requires efficient transmission lines and new systems of microgrids, which in turn requires climate data, analytics and environmental intelligence. NCEI provides access to the world’s most comprehensive archive of atmospheric, coastal, oceanic, and geophysical data. NCEI engages with users to improve their understanding of its products and services and seek feedback to make its environmental information more useful not only to the energy industry, but to other industries and the Nation. The event takes place at The Collider, a world-class innovation center in the heart of downtown Asheville beginning June 14, 12pm to 6pm, and running through June 15, 8:15am to 4:00pm. Utilities executives share perspectives on the current state of their grid, their climate risks and vulnerabilities and the future of renewables in their portfolio. Solution providers demonstrate how environmental information has been used in asset planning and strategy, resilience planning and strategy, and load planning. Thought leaders discuss the critical role of renewables and the right mix of energy to build an adaptive infrastructure while reducing carbon dioxide. Scientific experts from NCEI and its partners interact with the energy industry leaders and solution providers to provide insights into and receive feedback on its environmental information. The U.S. Energy Information Administration forecasts that non-hydro renewables will rise, from 2% in 2005, to a total of 10% of electricity generated in 2018. Not only essential for meeting energy demand, wind, solar and hydro are cost competitive with conventional generation (Lazard). Central to this discussion is the ability to transform the nation’s long distance transmission lines to move energy from decarbonized-production areas to centers of energy consumption. Industries are gearing up for business in the new era and balancing and optimizing intermittency resources. Climate and environmental intelligence can provide important information in this decision-making process, with the grid on the frontlines. Raising the level and investment in renewables requires efficient transmission lines and new systems of microgrids, both of which require innovation in design and engineering, and advanced analytics that address risks like climate change and extreme events. Environmental and climate data and information on extremes can aid in the design, planning and implementation of the modernized integrated grid that can support economics for the company and economic growth overall, aid in minimizing our impact to the environment, and help address climate change risks. Energy industry professionals, planners, adaptation professions, renewable energy experts, and scientists working in this area. More information on the forum, including instructions on registering, is available here.